Duality abounds this weekend, when ALDLAND takes you live to Florida vs. Vanderbilt in Nashville on Saturday evening. Magalan and I will be in the stadium, along with VSL‘s Bobby O’Shea, for another game against another nationally ranked SEC East opponent. Indeed, it appears it will be the third time this season that Vanderbilt has played a top-ten team, and each of those opponents– South Carolina, Georgia, and now Florida– has been an SEC East foe. Vanderbilt was a play away from beating both Georgia and Florida last year. This year, Georgia destroyed Vandy. Will the Commodores’ rematch with the Gators go the same way? Many are calling this a trap game for Florida, sandwiched between an emotional home win over LSU and a big game against South Carolina next week. I don’t think Florida is as good as the national commentators say they are, but Vanderbilt has more problems than its coach and fans want to admit as well. Their win at Missouri was a big boost, though. My reasonable hope for this game is that it goes like the season opener against South Carolina: VU plays UF close all game and has a chance to win it in the fourth quarter. 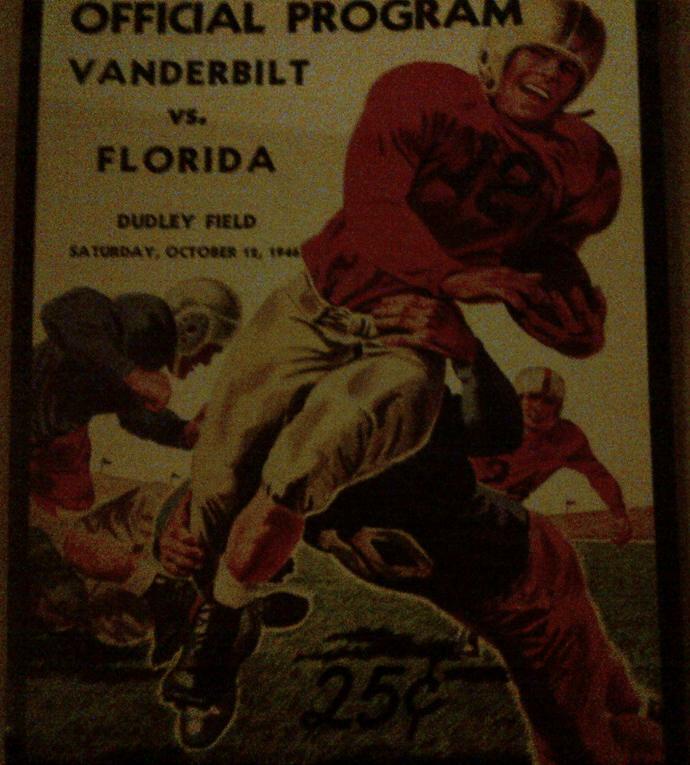 A final note on similarities between the Georgia and Florida games is the photograph at the top of this post, which, like the one in the Georgia preview, depicts a game between these two teams on nearly the same day, sixty-six years ago. Also like that old Georgia matchup, Vanderbilt beat Florida in this one, 20-0. Looking forward to their meeting tomorrow. Stay tuned here for coverage after the game. This entry was posted in ALDLAND and tagged college football, florida, nashville, sec, vanderbilt by AD. Bookmark the permalink.